I’m looking into leasing a 2019 Ford Fusion Energi Titanium Trim (Fully loaded). This is the information the dealer used to create me an out the door quote. Can you let me know if these numbers make sense and if it’s a good deal to jump on? So if I understand it all correctly, if I pay $399 for 36 months and then buy out the car if I decide to, I will be paying ~$29,000? I was thinking of trying to negotiate the Selling Price, as KBB shows this car to be sold around $33,100.00… I’m a newbie at this so any help would be appreciated. Horrible residual and lease rate. If the residual is 14,700, why would you pay 29,000 at lease end to buy out the car? Doesn’t make sense. Sorry, maybe I wasn’t clear with my numbers, I got the calculation with ($399 * 36) + $14,700 = $29,000 in total for the vehicle. buy out the car if I decide to, I will be paying ~$29,000? Sounds like you were asking if the 29,000 is the buyout. I’m well aware that FMC does not use an MF. The 1.5% lease rate seems high. I would ask for the base rate (no mark-up). Also, check the residual at edmunds.com . That seems extremely low. Ok, fair enough, I can see that I worded it confusing. Good morning! May I have the MF, Residual and Incentives on a 36/12k for 90706? Thanks! What trim level? So I should be looking for an APR closer to 0.50%? I don’t know what the base lease rate is. But, I have a hard time believing that it’s 1.50%. 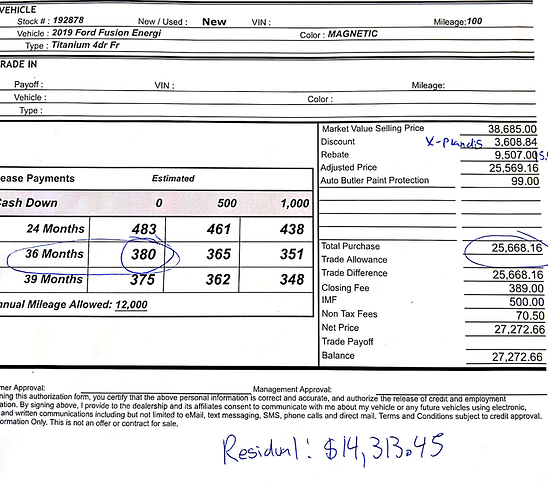 The reason for the 9507 rebate is likely due to the lousy residual. This rebate seems fair. Your amount due at start appears to be your first payment of 399.13 plus a dmv fee of 85 (I’m guessing). You’re getting an 8% discount off MSRP. I would research the sell price and get that down to perhaps a 15% discount… The only thing that puzzles me is the taxes. The only thing that puzzles me is the taxes. This is the information I found when searching, is this accurate? And if so, does this mean the dealer is padding the numbers for profit? In the state of South Carolina, the maximum tax which can be applicable is 300 dollars per lease. In addition, any rentals for 31 days or less is considered to be subject to an additional surcharge. 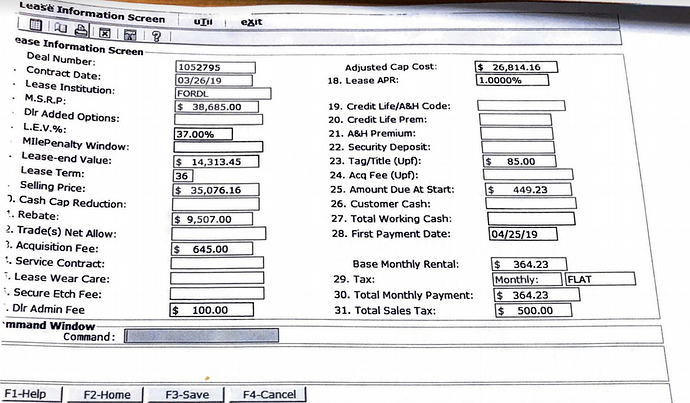 Edit: Looks like that information is outdated, per This Document sales tax on vehicles in South Carolina has increased to a cap of $500, which coincides with the lease details. When I read SC, that explained everything. Yes, they have a $500 tax cap. Love the Carolinas’! Used to go to UNC Chapel Hill for math conferences. Are you anywhere near Hilton Head? I got a quote on an Energi for 10.5k/39mos and the MF was 0.6% or .00025. Residual was 36% and even with my $10007 lease cash plus $500 grad the lease was still $425/mo. Hard pass. Are you anywhere near Hilton Head? I’m about 4 hours from there, I’m right between Charlotte and Atlanta. Does this now sound like an appealing deal? I’d ask your finance manager about the tax credit Ford Credit gets and see I’d they can take some more off. Doesn’t seem fair that they get a tax credit and you benefit $0! How do you know the base rate is 0.50%? All else sounds good. Wasn’t aware of any tax credit but, check it out. If so, they shouldn’t be commingling tax credits with rebates. They should be stated separately. It’s called transparency. How do you know the base rate is 0.50%? Okay, that’s great! If you qualify (credit 720+), it shouldn’t be a problem. Hello I am an X-Plan Ford Partner. I am in the process of contacting several dealers in the area to see if I can get the following lease offer. I will sign and pay the same day if my offer is accepted. I have done countless hours of research based on various consumer websites, dealership inventory pages, and reached out to personal contacts. We feel the numbers I’m asking for are reasonable. I look forward to your reply and I hope that XXXX Ford wants to do business with me! Wish me luck and thanks for all of your help! Interested to see how you do! good luck! I’ve been answering emails and calls all day with dealers. The remaining dealers are still working on the numbers and I’m awaiting their calls… My sweet spot will be $33,500 I think, but not looking promising so far. @delta737h Here is my latest offer, looks like they are trying to now sneak in a damn paint protection plan … This document really doesn’t give all the info… Also the math doesn’t even add up. How does it go from $25,668.16 to $27,272?? $389+$500+$70.50 = $959.50 which would be $26,627.66… $644 mysterious dollars. How does this lease look to you?